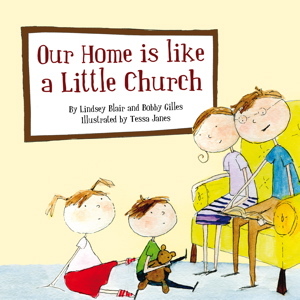 Our Home is like a Little Church, written by Bobby Gilles and Lindsey Blair with illustrations by Tessa Janes, is now available from Amazon.com and the Westminster Bookstore. The book has been published by Christian Focus Publications, and is part of the SojournKids collection. Many churches and children’s ministries have purchased copies for all new fathers/babies, and many families and churches have used Our Home Is Like A Little Church as gifts for Father’s Day. Our Home is like a Little Church beautifully illustrates the Biblical role that each father is called to play in the lives of his children. The apostle Paul states in 1 Thessalonians 2 that he has dealt with the Thessalonian church the same way that a father deals with his children….”encouraging, comforting and urging [them], to live lives worthy of God.” I pray that every father that reads this powerful little book will have the courage to lead his family to live life for the Glory of God and nothing less. I LOVE the book because it provides a beautiful picture of what it looks like for a father to be the spiritual leader in the home. It simplifies this profound truth in a way that can be easily understood by everyone in the family. One of the most important features of a father’s leadership in his home is his responsibility to train his children in the Scriptures and the Christian faith, and to nurture them in knowing and loving God. In this sense, fathers are pastors (i.e., shepherds) to their children, and they would do well to embrace this truth as their own. Our Home is like a Little Church helps both children and fathers see some of the beauty and richness of this relationship. How good it will be when an increasing number of Christian fathers own their roles as their family’s pastors. May this little book be used by God to serve that end. This is an excellent book and I have sought to get a copy into the hands of every family at our church. It is a story about fathers leading their families at home as the pastor leads the church. The great old concept of “every father the pastor of the church meeting in his house” is portrayed here in an engaging and compelling way. The left hand pages comment on what the pastor does at church. The right hand pages then comment on how the dad does a similar thing in leading his family at home. Reading this then will urge fathers forward and give them some built-in accountability as children will look to see that the things read about are actually done! The book is simply written in a nice rhyme with nice illustrations. This little book has the potential to accomplish much good. I encourage you to get a copy for yourself and then get copies for families you could give it to. This book is a great introduction to the practice of family worship and how the church and the home are interrelated. The authors alternate between church and home and show how each element of worship (outside of baptism and the Lord’s Supper) can be done at home through family worship. This has become an important direction that many in the church are beginning to move toward. There has become an emphasis on family worship and its importance to the health of the church in recent years. If you are involved in children’s ministry, this is an excellent resource to own. It is also a way in which you can introduce family worship to the parents through the children.